Although personally I am more of a B1 In Search of the Unknown person, B2 The Keep on the Borderlands apparently resonated with a huge audience, as it continues to inspire homages almost 40 years later. 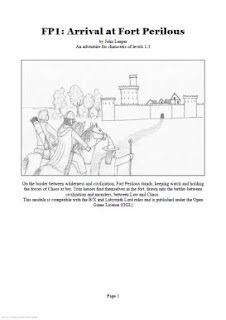 The most recent homage is the first product from John Leeper and Grey Goblin Games, FP1 Arrival At Fort Perilous. 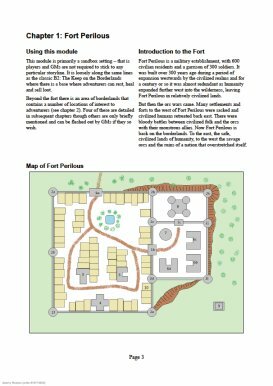 The modestly priced ($2.20) 30 page module follows that basic setup, almost exactly, there is a lone (more or less) outpost in the wilderness that serves as a home base for low level parties to go out and explore. The difference is, rather than one large, multi-faction dungeon to explore, there are three separate smaller dungeons, two out in the wilderness, one essentially part of the fort itself (well, right outside), each with a single faction. The first dungeon, Shrine of the Orcs is exactly that, a small-ish (17 room) dungeon full of orcs, and almost entirely orcs (30 or so). There are some wolves and giant rats and potentially some ghouls, if the party is dumb. There is some minor variation on them, orcs that are clerics, basically. It's a normal, logical dungeon, with nothing weird. 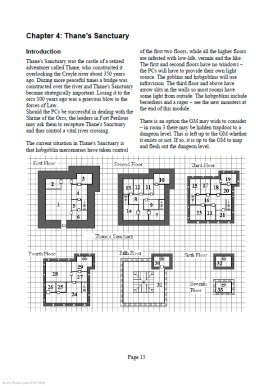 The second dungeon, Thane's Sanctuary, is a former adventurer's tower of about 30 locations, now occupied by goblins and hobgoblins, at least on the first two floors. 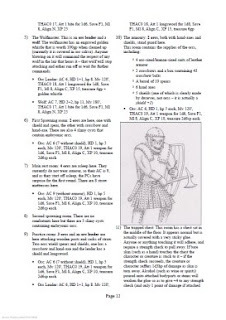 The hobgoblins are a bit different than standard ones, there are a few that go berzerk and are tougher. The upper towers are sparsely populated by monstrous vermin, including sprites. As with the first, it's a "realistic" dungeon. In both cases, in order to avoid the moral implications that come with female humanoids and young, in this they spawn from pod like cysts. Or cyst like pods. Just like '70s game show hosts. 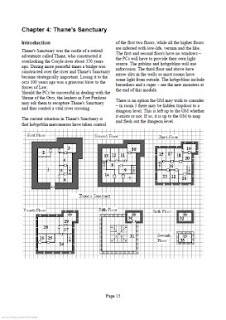 The last dungeon of 25 rooms is probably the most interesting, Lord Willverin's Folly. He was a former ruler of Fort Perilous who had something of a dark (or since this is Basic, Chaotic) side. The encounters here are more varied, but the primary antagonists are Chaos Cult members. Despite the Chaos connection, it's still fairly mundane, with the most unusual thing being barrel traps that explode. Aside from the dungeons and keep, you get a wilderness map with a paragraph or so describing the general area. This is well done, containing a lot of potential adventure hooks (presumably followed up in later modules in the series) and has a nice, cohesive feel. 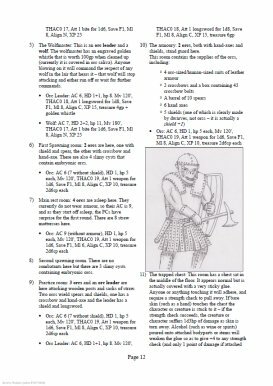 There's only a handful of NPCs described, the head of the fort, the head of the guard, the chief cleric, two halfling innkeeps, and the fort's armorer. They are a rather staid bunch. The layout is no frills, easy to read, as are the maps, though the little details (like beds and corpses) are drawn on them. It's also illustrated by the author. The artwork is not on a professional level, but at least it's original. I have a preference for this style, over gobs and gobs of stock art. While a competent enough product, FP1 Arrival at For Perilous seems perhaps best used not on its own, but in conjunction with B2, or when you need an orc or hobgoblin lair. Standalone, it lacks the depth and complexity of B2. On the other hand, if you want something simpler for newer players, this might fit your bill. The general setting is also well done, if you need a wilderness location for your game. It's also quite child friendly.